The City of Sullivan, Missouri is accepting applications for the position of Police Officer. Applicants must be 21 years of age at the time of appointment, a citizen of the United States, a high school graduate or equivalent, possess a valid Missouri driver's license and be POST certified with the State of Missouri. 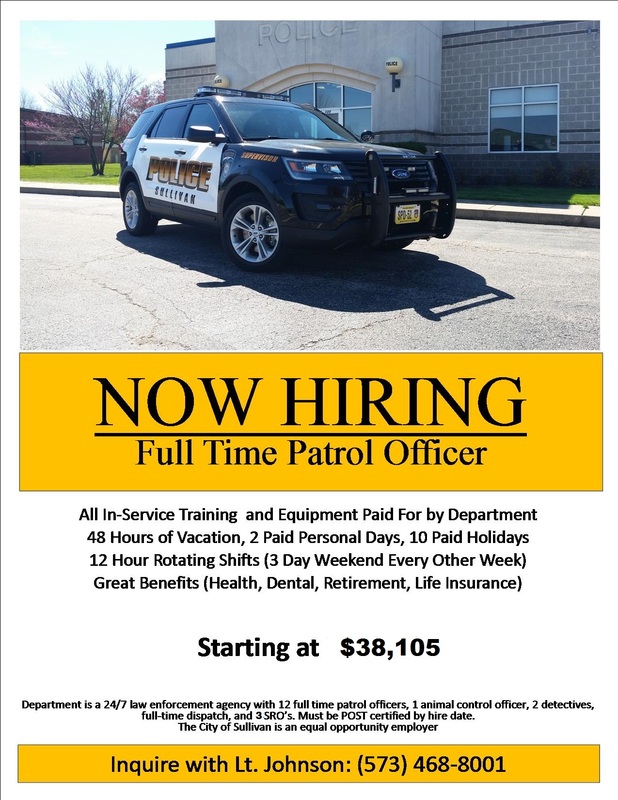 Current Pay Range and Benefits: Starting pay $38,105 per year, plus comprehensive benefit package including; cost shared health insurance for officer and dependents, sick leave, 2 personal days, 10 paid holidays, 48 hours vacation increasing to 96 hours after one year, employer paid life insurance and LAGERS L-6 retirement package. All training, uniforms and equipment paid by the Department. Officers work 12 hour shifts with every other weekend being a 3 day weekend. Applicants seeking employment are required to complete an application and testing process. 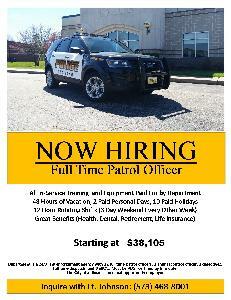 Applications for employment may be obtained at Police Headquarters, 106 Progress Drive, Sullivan, Mo. 63080. Applications must be completed and returned by 5 p.m. on December 6th, 2018. The City of Sullivan is an Equal Opportunity Employer.